Key features and advice for those looking to get the most out of Common Sense Education. If you're a social studies teacher, Common Sense Education has a lot to offer. So much, in fact, that it can be overwhelming at first. No need to worry. Whether you're new to Common Sense Education or just looking for a refresher, this primer can help. Below are some key Common Sense Education features that teachers rely on and enjoy. For each, we've also included some "pro tips" for how to get the most out of each feature. Have your own features or tips? Let us know in the comments. 1. Looking for the best tools? Check out our Top Picks. If you're short on time and just looking for a great tool to check out, head straight to Top Picks. These lists are updated regularly by Common Sense Education editors and are a mix of broader best-ofs and more topical lists. Tip: Since there are nearly 200 lists, do some filtering. Social studies teachers should check out the "Subjects" filters to find some great learning tools for social studies classrooms. Tip: The most recently updated lists are the first results by default. 2. Looking for something specific? Try Search. Sometimes you have something very specific in mind, whether it's a tool you've used or a unique need (such as websites on the American Revolution). When that's the case, head straight to the Search tool. What's great about Search is you can find content across the entire site: reviews, lessons, lists, teacher-curated boards, and more. Make sure to use the content tabs at the top, and don't forget the filters on the left to refine as you go. Tip: There's a "Special Needs" filter under "Great With" that'll surface tools well-suited to special populations. Tip: Looking to connect with other teachers you know on Common Sense Education? Search a name, and select the "Members" tab. 3. Find something you want to use? Save it. The purpose of Common Sense Education is to quickly connect you with great tools and practices you can use. But what use is anything if you forget what you found? That's where saving comes in. 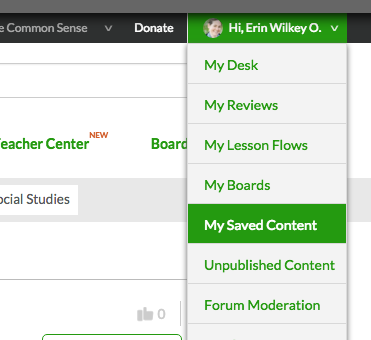 Everything you find on Common Sense Education can be saved by clicking the "Save" button found at the top right. To retrieve saved items, hover your cursor over your name at the top right of the screen and look for "My Saved Content." Tip: Saved items can be organized into collections called "Collections" -- think Pinterest boards but for Common Sense Education content. Once you have a Collection you like, you can share it with others. Tip: Collections -- even your own! -- can also be saved and organized. By organizing a few of your own Collections into a single Collection, you can share a bunch of Collections with colleagues with one easy click. Click here to find out more about Collections. 4. Want to share your thoughts on a tool? Write a Teacher Review. In addition to the main Editorial Reviews, each tool on Common Sense Education can be rated and reviewed by teachers. These reviews focus on advice and teaching tips straight from classrooms, and the cumulative rating gets displayed at the top of the review page. Do some searching to find tools you've used, and add a Teacher Review to share your take. And if you found a tool on Common Sense Education and used it, come back and let us and other teachers know how it went. Tip: Some tools you find on Common Sense Education won't have an Editorial Review. We call those "Teacher Takes." When you write a review on a "Teacher Take," it's only the teachers' evaluation that Common Sense Education users see. Tip: Developers look at Teacher Reviews, too, so writing one is a great chance to have an impact on design and development. 5. Not quite sure what you're looking for? 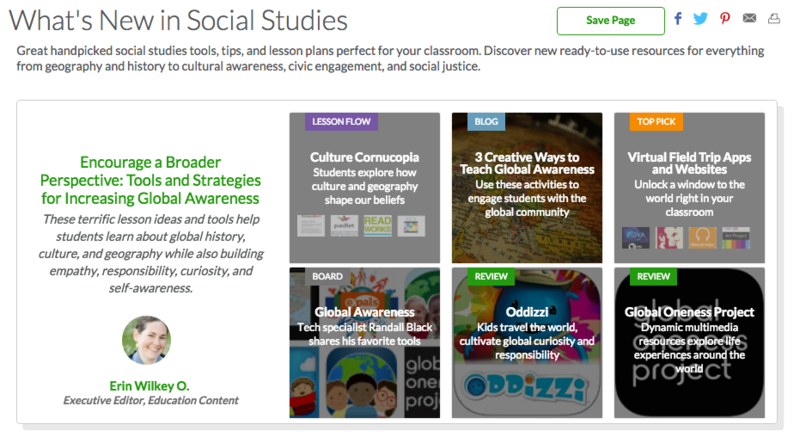 Check out What's New in Social Studies. 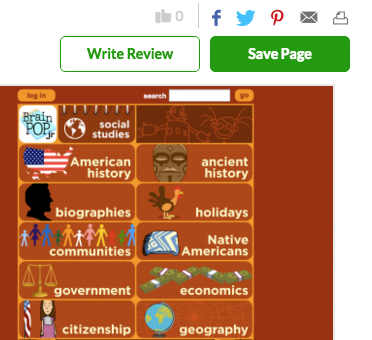 What's New in Social Studies is a perfect page to bookmark and return to when you're wondering what's been happening on Common Sense Education. The page is updated regularly with curated and themed content, discussions, and trending tools, lessons, and lists. Tip: The “Cover Stories” at the top of the page are archived; you can browse a selection of past stories by hovering and clicking on the right arrow. Tip: Have a question about tools and best practices? Post in the discussions to get quick answers from expert teachers from the Common Sense Education Certified Educator community.